WINCHESTER, Va., November 1, 2012 – Trex Company, the world’s largest manufacturer of high-performance wood-alternative decking and railing, is introducing new Trex Select™ decking and railing system, which brings the superior durability and aesthetics of the Trex brand to a new category of DIY consumers. The high-performance decking and railing features a combination of design flexibility and long-lasting good looks at an affordable price point. Trex Select composite decking is wrapped in the signature Trex protective shell, which defends against severe weather, heavy foot traffic and everyday mishaps like wet planter pots, spilled food and dropped grilling tools. In fact, Trex Select resists both stains and mold, and guards against fading better than traditional composites, while offering a soft, splinter-free finish that is comfortable underfoot. Unlike wood, the product requires no sanding, staining or painting, and spills wash off easily with just soap and water. Manufactured of a shelled composite material, Trex Select railing offers a similar level of beauty, performance and ultra-low maintenance. Guaranteed to look better and endure longer than wood or all-vinyl railing options, Trex Select railing won’t warp, rot or splinter. True to Trex’s eco-friendly legacy, Trex Select decking is manufactured of 95 percent recycled content – including reclaimed wood, sawdust and plastics – while Trex Select railing is made from Fibrex®*, a material that contains 40 percent reclaimed wood fiber by weight. Naturally beautiful, Trex Select decking is available in four nature-inspired colors with realistic wood grains – Madeira (a redwood look), Winchester Grey (a rich and versatile grey), Saddle (a light brown) and Woodland Brown (a deep, earthy shade). All colors complement the style of any home and the taste of any homeowner. Deck boards are offered in 12', 16' and 20' lengths. Coordinating fascia also is available in 1”x8” and 1”x12” sizes. The versatile white hue of Trex Select railing is designed to pair beautifully with any color decking or the color of any home. 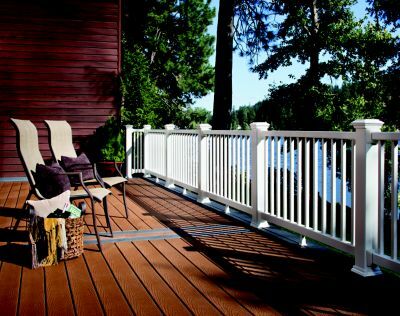 The white rails and balusters may be mixed and matched with Trex Post Sleeves, Post Sleeve Caps and Post Sleeve Skirts (available in seven colors) for a premium, customized look. Ideal for the do-it-yourself homeowner, Trex Select decking features a square-edge profile for easy installation, and the sturdy construction of Trex Select railing uses an external bracket system for quick and easy installation that also is code-compliant. The entire Trex Select collection is backed by a 25-year Limited Residential Warranty, which provides lasting peace-of-mind. For more information about Trex products, visit trex.com. *“Fibrex®” is a trademark of, and is used by Trex Company, Inc., under a license with Andersen Corporation.